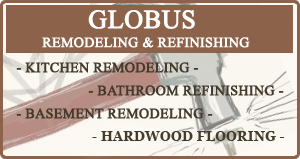 Welcome to the Globus Remodeling services page. We are a fully licensed, bonded, and insured home construction and home remodeling company that has been in the business for many years. We serve New Jersey and the New York City area. We use the highest quality materials from the top name brands. If you are in need of home remodeling or home construction, give us a call and see what we can do for you. So for all your home construction and home remodeling needs in and around New York City give us a call.